Graffiti is a problem affecting many cities throughout the world. The defacement of both public and private property due to instances of graffiti, is one of the most common forms of vandalism. In most cases, graffiti is a means by which a gang displays their operating area, most often as a warning to rival gang’s to stay out. This type of gang-graffiti causes further recurrences of the crime as it invites rival gangs to display their warnings over the previous criminal’s display. Complete abatement of gang-related graffiti is hard to accomplish as the tenacious character of gang-member attitudes are difficult to suppress. It is here that exists a never-ending cycle of repetitive graffiti cleanup, only to see the newly cleaned area fall victim to further instances of graffiti. 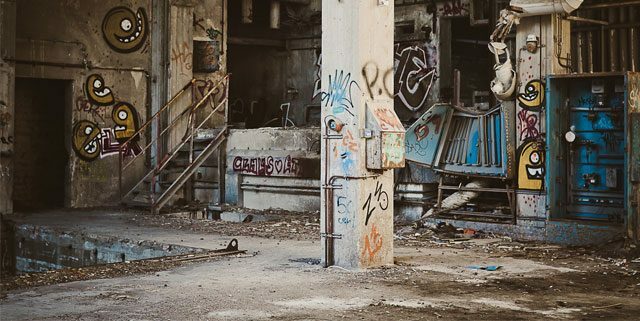 Despite many regions in the U.S. enacting new legislation to help deal with the crime of graffiti, stiffer fines and harsher punishments have done little in the way of preventing this vandalism from occurring. Another popular form of graffiti falls under the misdirected perception of “street” or “urban” art. While many of these artists can show varying degrees of talent, their acts are still a crime when committed without property owners’ permission. Apart from gang-related graffiti and “street artist” graffiti, defacing property is also a crime of vandalism. Writing one’s name or drawing on a restroom stall is considered graffiti. The type of behavior that leads to this criminal act is often said to be due to boredom or an acting-out because of anger, contributing to delinquency. Behavior modification systems, such as after-school programs or regular therapy, can often show a reduction in instances of delinquent behavior. The sudden interruption of an individual committing the crime of graffiti can lead to a transition in attitude when the individual is allowed to reflect on the consequences of their negative behavior. The graffiti camera employs on-board technology that stops the crime from being committed. The interruption of those committing the crime of graffiti, due to the graffiti camera, modifies the behavior of the individual previously engaged in the act. It is time to re-think how you are stopping graffiti.